The cost of dental implants may appear high, but the price continues coming down. And if you consider the benefits, the time involved and the expertise of your specialist implants are worth every penny. To help you understand and appreciate the cost let’s explore the aspects of price and how different dental implants may differ depending on various factors. If the price is too good to be true? It probably is. The cost of a dental implant ranges from around $1,500 up to $5,000.00. Anything less may be an indicator that you’re getting an inferior product or an implant that’s not designed for a particular location in your mouth. Short term the implant device may appear to be fully functional, but operationally it won’t last. The difference may be likened to the difference between Toyo’s and Michelin tires. Here again you may get what you pay for and the initial cost may appear affordable, but in the long term you are going to get a better result with how it functions and how long it lasts if your provider installs Michelins. The real concern for the patient is ‘where and how’ to find an inexpensive quality dental implant, and most likely the driving adjective is ‘inexpensive’. This perception by the patient is that teeth are utilitarian to their daily life. That’s really not the case, but to put the cost into perspective let’s examine what goes into the cost of a dental implant. A lot of your choice and cost may depend on the choice of your provider. It’s not to say the more you spend the better you will be. Rather, a reputable practitioner, who is truly trained in the placement and restoration (and this may be two providers), may be a significant factor in what you end up with and what it costs. Trust and reputation are the more difficult factors to define for the patient. Call us to see if you are an implant candidate. Dental implants are among the most successful procedures in dentistry today. Given the complexity of the procedure, there are a lot of variables that come into play. Yet studies show a five-year success rate of 95 percent for lower jaw implants and 90 percent for upper jaw implants. One factor that impacts your success is your pre-existing health conditions. Another is the location of the missing tooth. Also, smokers statistically face a higher risk of implant failure. Other high risk candidates are patients with diabetes, hemophilia or immune deficiencies and in rare instances, patients with chronic bruxism. So as long as one engages in good oral hygiene, i.e. brushing, flossing, and regular hygiene procedures, the chances of inflammation or swelling of the tissues surrounding the implant should be avoidable. Key factors in minimizing dental implant complications are the selection of an experienced prosthodontist and implantologist who specialize in implant dentistry, careful pre-operative treatment planning and proper after-care and oral hygiene. One of the benefits of a multi-specialist practice like ours is everything is under one roof including periodontal after-care. 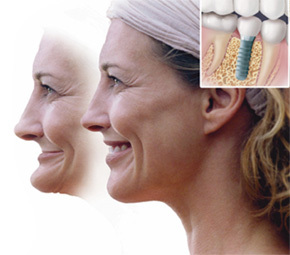 If you would like to know whether you are a candidate for implants please feel free to call for a free consultation. The success rate for upper jaw implants is lower because the upper jaw is less dense than the lower jaw, making the success of implantation and osseo-integration slightly more difficult to achieve. Dental or Global health issues. A Dental Implant is a more affordable and natural replacement that’s better than a Dental Bridge. A dental bridge requires the cutting two adjacent healthy teeth to support the bridge. If you aren’t aware, a bridge consists of a false tooth (or teeth) supported by adjacent teeth that have been capped. It is used to replace one or two missing teeth. A bridge requires two often healthy teeth to be altered, which is not an ideal way of replacing a missing tooth compared to a dental implant. Bridges tend to have short lives, five to ten years, compared to a dental implant, which can last a lifetime. So while a bridge can sometimes be more economical at first, in the long run a dental implant can cost you less. Free Dental Implant Consultation at the Right Smile Centers. Meet with Drs. Scheinfeld and Orland and learn more about the different options for missing teeth and about the dental implant procedure. See if you’re a candidate for dental implants. One of the best advantages of an implant is that it will restore your full chewing power. Most patients can’t tell the difference between their natural teeth and the implant tooth. They eat with it completely normally, and they brush and floss normally as well. Where a dental bridge may only last around 10 to 15 years, dental implants can last a lifetime with the right care. Today’s implants are made from titanium and integrate with your jawbone. Titanium is bio-compatible, meaning that they are non-toxic and not rejected by the body. All in all it makes a powerful replacement tooth. The gap from a missing tooth can cause adjacent teeth to shift towards the gap without the support of the adjacent tooth. This pulls your teeth out of position and can affect your bite, your ability to chew and your appearance. It can also cause issues that make tooth replacement difficult later. Where there is no tooth, the jawbone in the empty space shrinks due to lack of root stimulation. If no implant is placed in the first year of losing a tooth, the bone area where the tooth is missing loses 25% of its volume, and bone loss continues year after year. Because an implant replaces the root as well as the tooth, and chewing is restored to normal, it provides the needed stimulation for natural bone growth. Facial sagging can be an unwanted effect of bone loss resulting from missing teeth. This is where the lower portion of the face starts to collapse, gradually closing the distance between the nose and the chin. Changes can include excess wrinkles around the mouth, thinning lips and a more pointed chin, making the person look a lot older than their true age. Contact us for your complimentary consult to see if you are a candidate for dental implants. Implants preserve facial bone structure. They are permanent, comfortable and most patients forget they have one. They osseointegrate into your bone structure and allow you to look good and eat like you never lost a tooth. If you choose to have this procedure completed, you won’t regret it. It will improve your lifestyle and will want to smile and eat with your new teeth. Scheinfelds and Orland can correct your problem of missing teeth. For professionals you can count on, visit and contact us at www.rightsmilecenter.com.